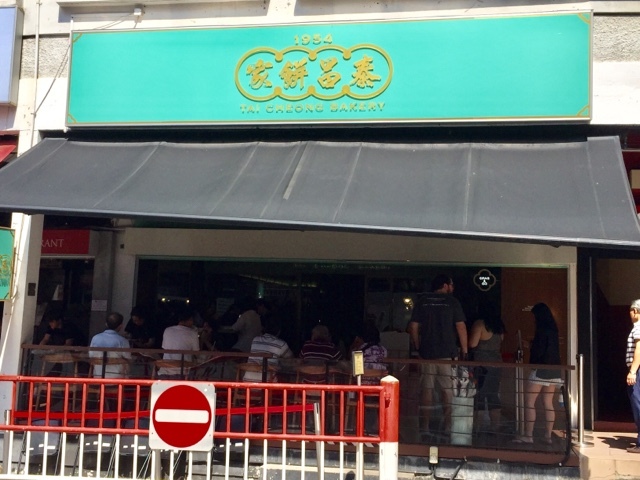 Tai Cheong Bakery, whose egg tarts has caused snaking queues in Takashimaya, has opened a cafe restaurant in Holland V last Nov 2016. 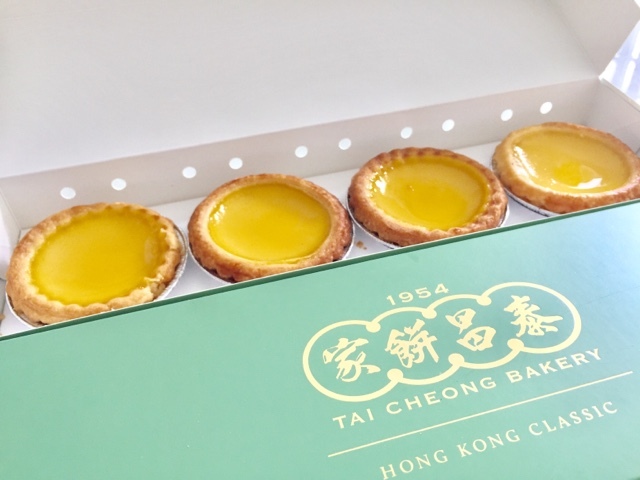 Craving for scrambled eggs and yummilicious egg tarts yet wondering if it is truly worth the queue? Thank God I arrived at 1045am on a Saturday. We managed to get a seat without waiting. My happiness was short lived because I was horrified that the waitress insisted that we had to share a booth seat with an uncle and auntie. 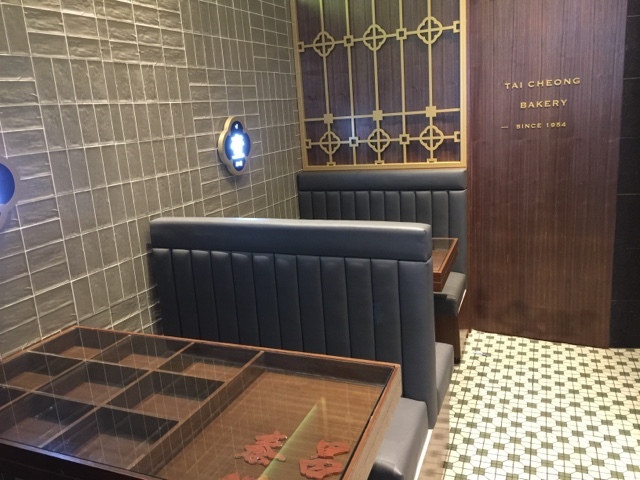 I did not mind tables that had to be really close to each other like Tim Ho Wan but booth seat is a tad too cosy for comfort. What if the uncle and auntie want to go toilet and they pai sey? What if they judge me for taking photos instead of treating food as food and just eat it? The uncle and auntie smiled graciously and that eased me a bit. They even offered us their extra cutlery. 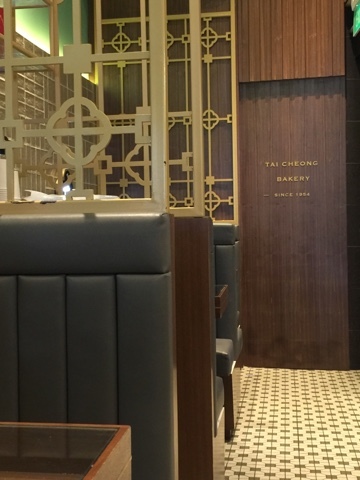 Tai Cheong only serves their hot mains from 11am onwards. Prior to that, one can only savour tarts and buns. Right after 11am, I saw a queue forming and it was so hot outside. All the Alfresco seats have been snapped up. Suddenly, I was relieved that I was sharing a booth seat in a cool environment with friendly Uncle and Auntie. Can I exchange the chicken chop for sausages? 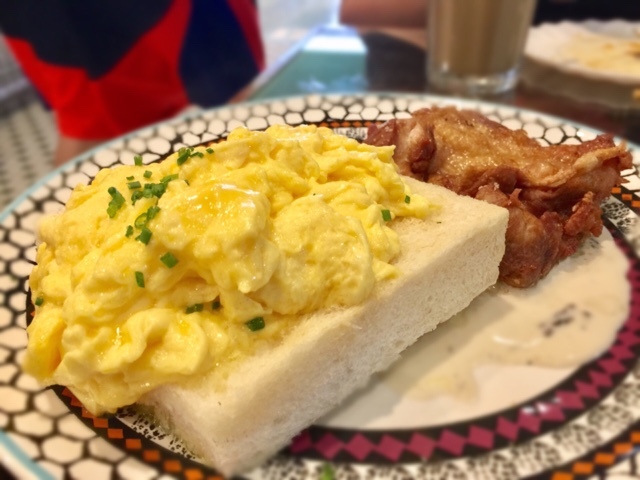 Immediately, the scrambled eggs and toast caught my eye as I know that Hong Kong is famous for their eggs and toast. 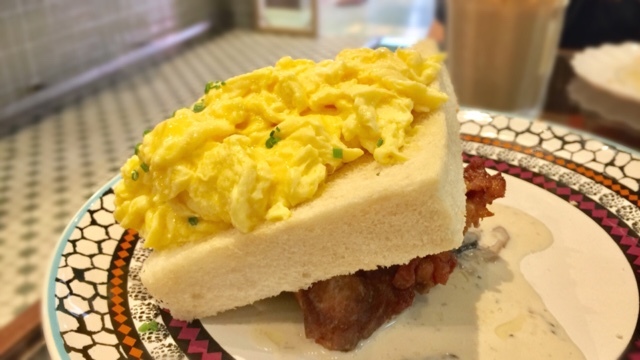 Oh my, when it was served, the glistening eggs stacked on top the toast was such an inviting sight. It wowed me because I had an eggs MELT IN THE MOUTH experience. It was not salty at all so you probably have to ask for pepper and salt from them as I did not see them displayed on the table. 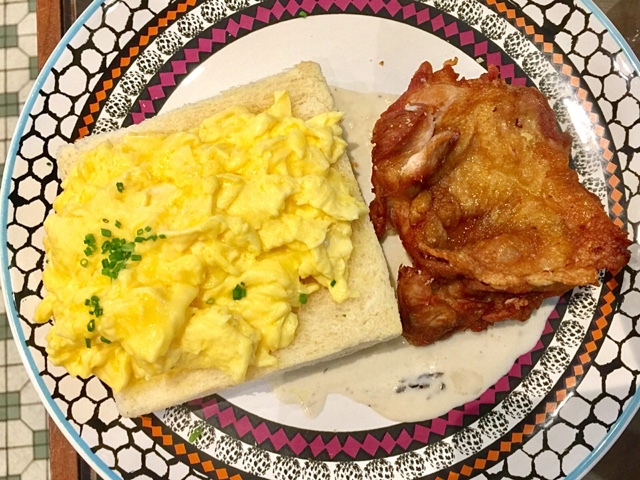 The chicken chop was really there to fill your stomach with protein because though it was crispy, it was not juicy, which is the hallmark of any good fried chicken chop. Still, it was a good addition to eggs and toast. I would have preferred sausages or luncheon meat anytime. We initially wanted to order the Beef with Truffle and Mushroom Sauce Rice but it was not available. We ordered the next interesting sounding item instead. When it was served, we were taken aback but the size. It was huge! It had a generous amount of meat and Kai Lan. The eggs were indeed silky and smooth, in fact, it was the best I have ever eaten. 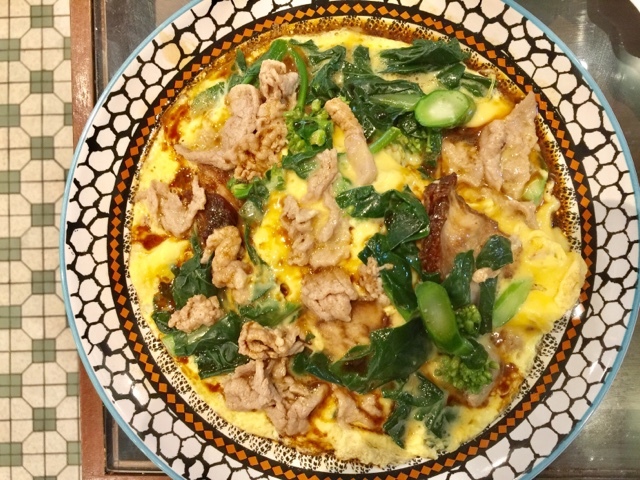 Every spoonful was a combo of smooth eggs with meat, vege and rice. If you enjoyed meshy stuff, you could consider this. I know of people who cannot stand meshy stuff and you might want to skip this. The Hong Kong beef was extremely tender but it did not taste like beef. It tasted more like venison or even pork? Still delicious. Ooo, I took a close up shot of this for fatty pork lovers. 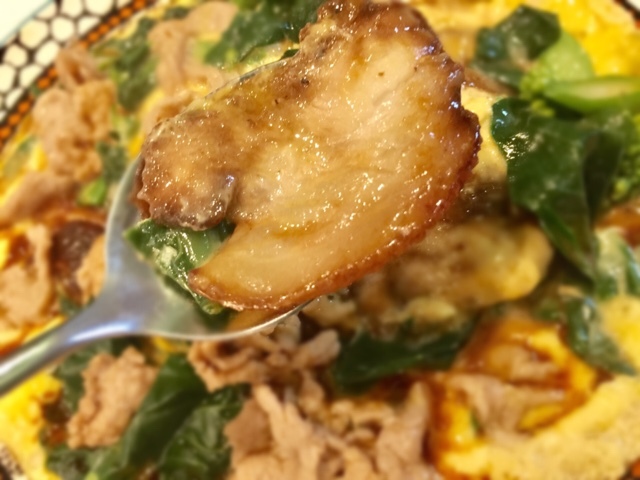 Pork fat can be very delicious if one could forget about high cholesterol. 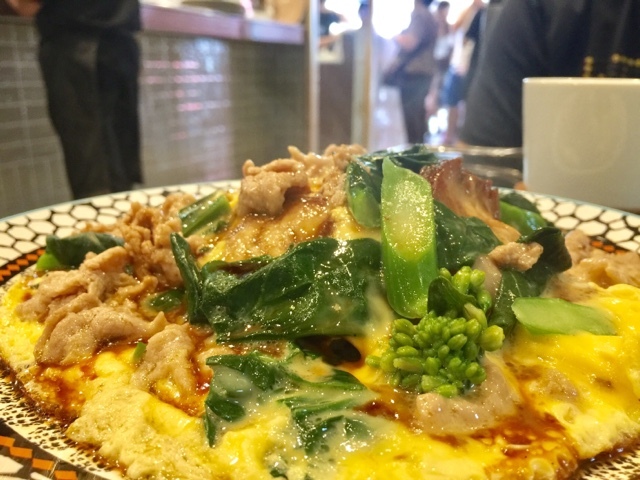 Imagine mixing melt in your mouth pork fat with your spoonful of silky eggs... Because of its sheer size and we had two dishes of eggs, it was a bit of an overkill. Lesson learnt, order just one eggs dish. This was my first time tasting Tai Cheong Egg Tarts because the queue at Takashimaya was forever long! I could not stand the wait. When it was served, it looked really appetising. The golden yellow custard against the slightly browned crust. 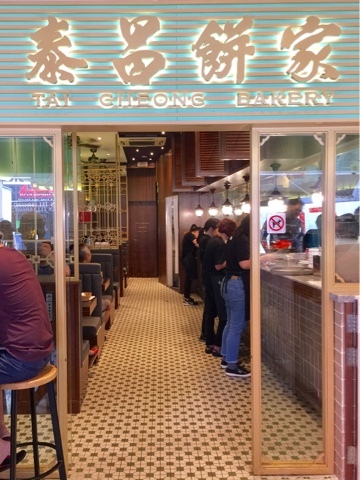 Tai Cheong bakes batches of fresh tarts from their ovens. The result would be a glossy sheen over the egg custard, screaming of freshness. As I sunk my teeth into the golden sun, the crust first caught my attention. 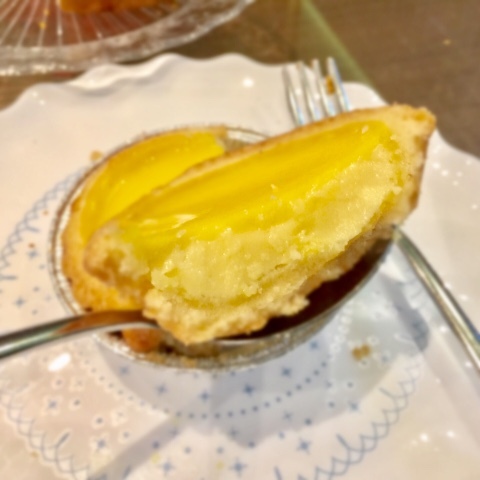 It was very buttery and it had a nice taste that I had not tasted in other egg tarts crust before - tasted of slightly burnt sugar yet it is not caramel. The egg custard had the right wobbliness yet it still retained its shape. Extremely soft and the sweetness of the custard combined with the buttery crust makes this an ideal snack. You know sometimes when something had been so hyped up like this Tai Cheong Egg Tarts, usually I would go Chey like that only. But after trying it myself, it was a "Oh now I know why people queue up." 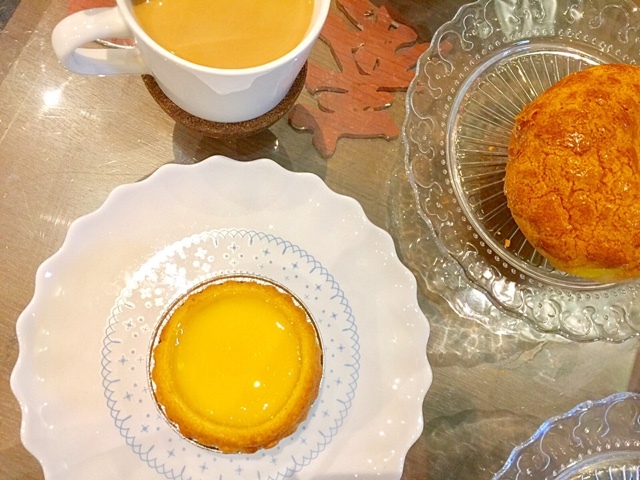 Can one find such delicious egg tarts easily in our usual bakeries in our neighbourhood? The answer is No. 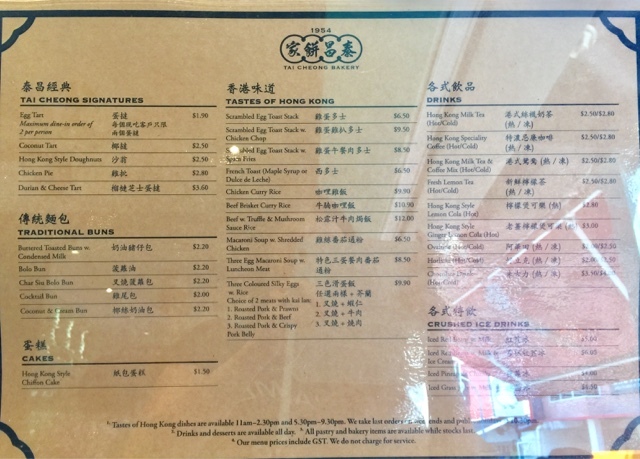 But is it the best in Hong Kong? The answer is also a No. I have been to Hong Kong a few times. 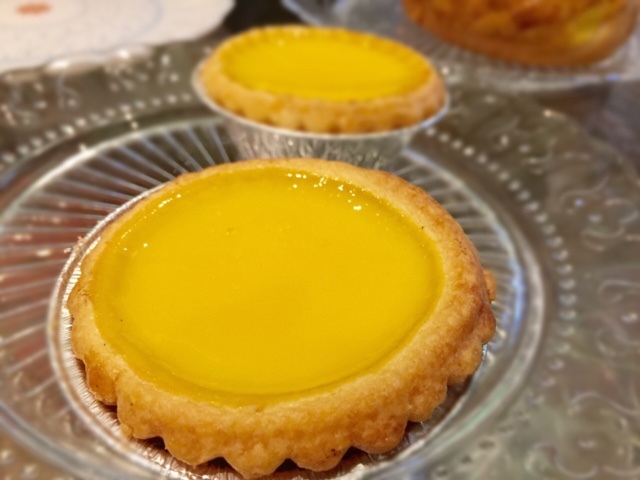 The best egg tarts are not sold in nicely decorated bakeries. They are sold in old traditional shops with antique looking silver ovens where they kept their tarts. The custard would melt in your mouth and the experience was out of the world. The Char Siu Bolo Bun was as delicious as Breadtalk version. 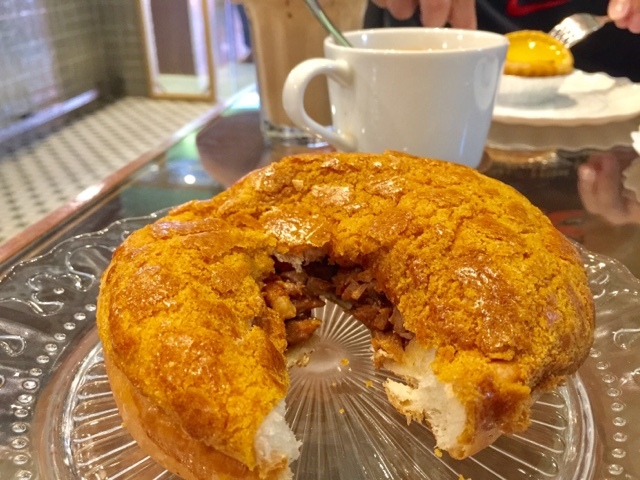 The crispy BBQ buns that Canton Paradise or some other HK restaurants serve are much nicer. 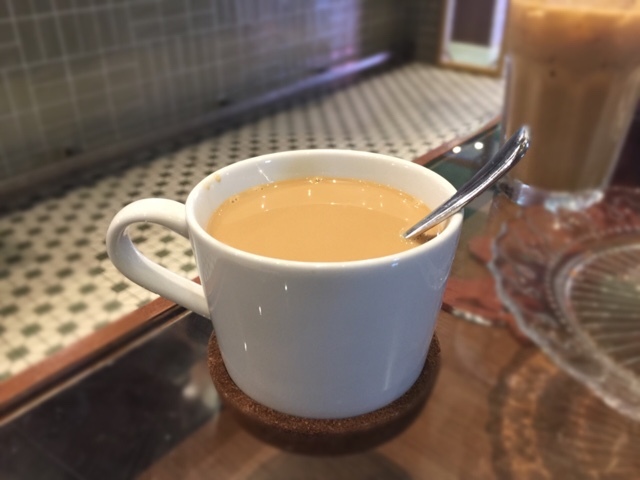 I was prepared for a very milky version of Hong Kong Milk Coffee and yes, it tasted very similar. It was not served sweet at all and it had quite a distinct bitter taste. It lacked the coffee aroma though but I guess HK coffee is like that. When it was served, it was not piping hot. I had to comfort myself that at least the not so hot coffee is not cancerous. Do you know that it is cancerous to drink very hot beverages? I must talk about the service! They really think that they are in Hong Kong. 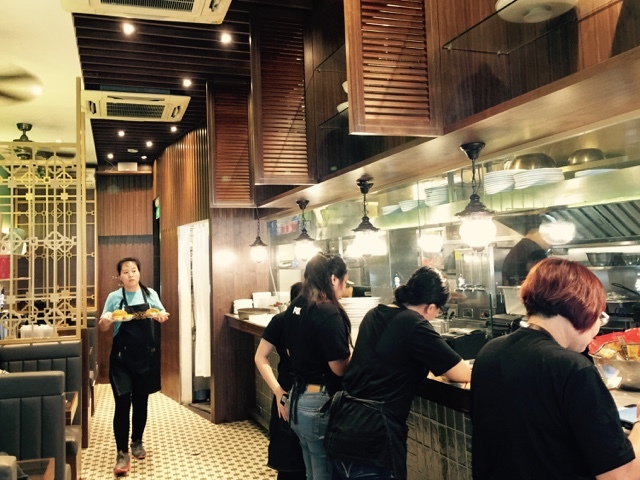 They have so many staff for a small eateries but don't expect smiley faces. They were straight to the point with the exception of one very young looking waitress who was so sweet. 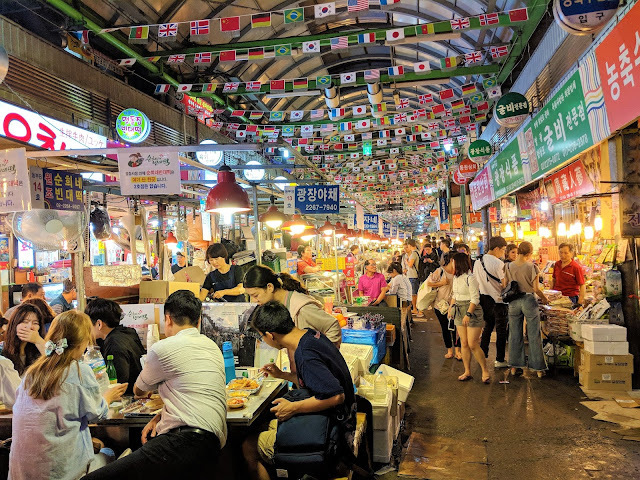 They also have inconsistent policies which is good if you think positively - if you ask Waitress 1 how many boxes of egg tarts you can tabao away at the table, she says only 1, if you want more than one, go queue at the takeaway counter outside. She was so straight face looking that I did not register my puzzlement. Well don't give up, ask Waitress 2. Waitress 2 says it is okay to buy more than one. No need to go outside and queue. 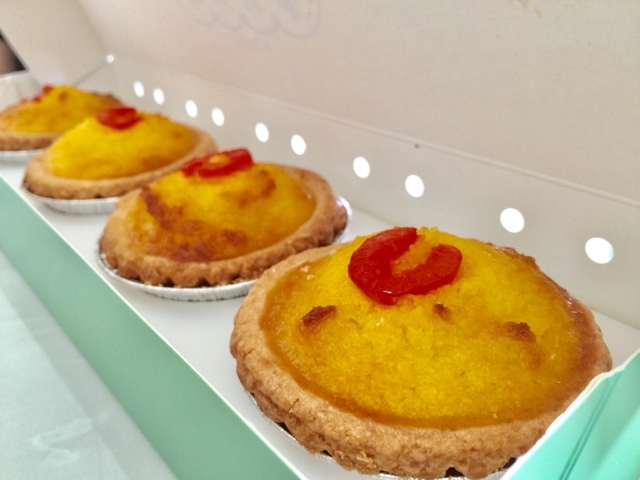 I also asked Waitress 2 if I could get 1 box of Egg Tarts and 1 box of Coconut Tarts instead of 2 boxes of Eggs Tarts, she said sure. Nice gal! Truffle Beef, you better be available in future! Overall, I enjoyed my experience and I would be back to try their Macaroni Soup with Shredded Chicken and the Beef Truffle that I missed today. And of course, I would make sure I arrive before 11am to avoid the queue. I just needed to order the tarts first and then order the hot mains later. Oh yah, and definitely in a group of four.